Begin by standing on a comfortable surface. Make sure you have plenty of room at each side. With a 10 lb (5 kg) potato sack in each hand, extend your arms straight out from your sides and hold them there as long as you can. Try to reach a full minute, and then relax. Each day you'll find that you can hold this position for just a bit longer. After a couple of weeks, move up to 25 lb (10-kg) potato sacks then eventually try to get to where you can lift a 60 lb (25 kg) potato sack in each hand and hold your arms straight for more than a full minute. 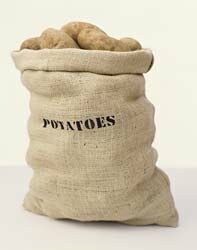 After you feel confident at that level, try putting a potato in each sack.